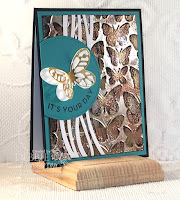 Welcome to the Crazy Crafters' Blog Hop with our Special Guest stamper, Debbie Henderson - we are thrilled to have Debbie join us this month and so excited to CASE (Copy And Selectively Edit) any project that has been created by her . Looking through all of Debbie's lovely cards, I ended up with a very long "short list" but eventually chose this card to CASE because I've been promising myself that I'd try the Tarnished Foil Technique for quite some time. I'm so glad I did, because it was enormous fun - so much so that you'll be seeing more of it from me in the days to come! Using Debbie's instructions, I started out by using the Layered Leaves 3D Dynamic Textured Impressions Embossing Folder on a piece of Silver Foil Sheet. I swiped a Basic Black Archival ink pad over it and left it to dry. Then I randomly patted the sheet with a Versamark pad and sprinkled it with gold embossing powder. I used a dry paintbrush to soften any hard edges in the embossing powder and then set it with the heat tool. I repeated this process with copper embossing powder and when I was happy with the metallics, I lightly added a bit more black with the ink pad. At this point, I cut my piece in half and used half for this card and half on another card that I'll show you tomorrow. I adhered my decorative piece to a Very Vanilla panel and added some ribbon (the 7/8" Striped Ribbon is a new product in the Holiday Catalogue and will be generally available from 1st September). This panel is attached to the Basic Black card with Adhesive Foam Strips. I stamped the "flower" design from the Eastern Beauty stamp set in Basic Black onto Very Vanilla and then cut it out with the coordinating die from the Eastern medallions thinlits (available as a bundle for a saving of 10%). 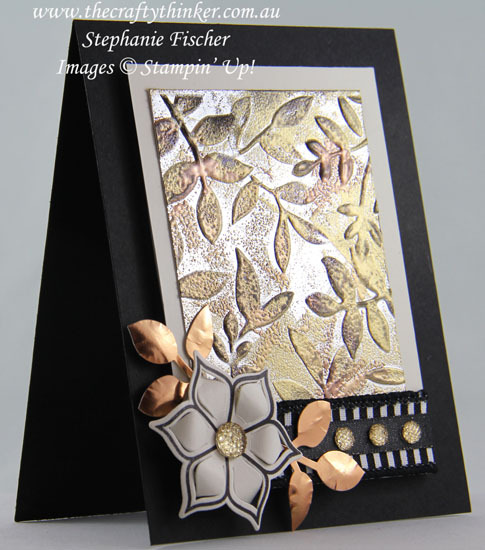 Having used my bone folder and ball tool to add some movement to the flower, I attached it with a Stampin' Dimensional. I also put some Mini Dimensionals behind each petal so that they'll maintain their shape through the postal system. 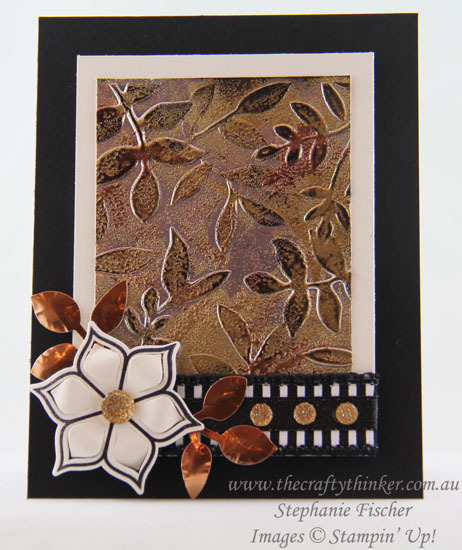 Using some Copper Foil Sheet, I cut some leaves with the new Leaf Punch from the Holiday Catalogue (also generally available from 1st September) and gave them a little dimension with a ball tool before adhering them to the card with some mini glue dots. The finishing touches were some of the Gold Faceted Gems.